Michael Robertson Finally Has a Good Idea, Mine. Robertson FINALLY has a good idea, which he talked about in his most recent Michael's Minute called byo.fm. Oh, wait, that's right, this wasn't Robertson's idea, it was MY idea from years ago when I pitched it to him at MP3.com, called My Way Radio. I've posted below one of the mocks I made when I made my pitch to Robertson. In fact, you can find the Power Point overview I put together for My Way Radio back then here. You won't see anything on byo.fm that wasn't discussed in my overview. Glad to see the light finally came on for him. 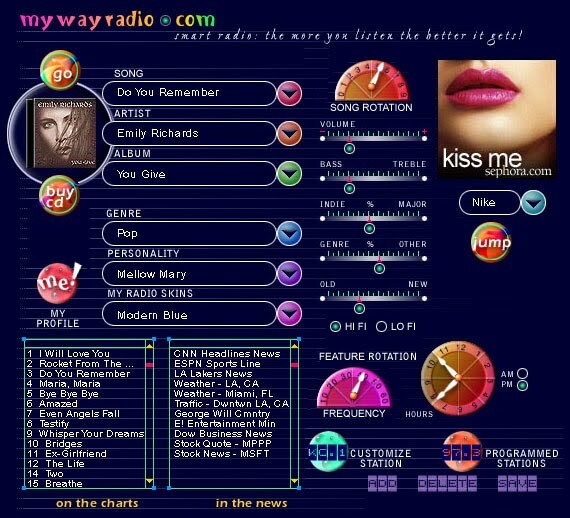 The mock I made for MyWayRadio.com from nearly ten years ago. As some of you know, each year I make my predictions for who I think will win American Idol and in what order I think the contestants will be voted off. (Here were my predictions for 2009 and for 2008.) I set my predictions after the first performance night of the Top 12 (which was last night). 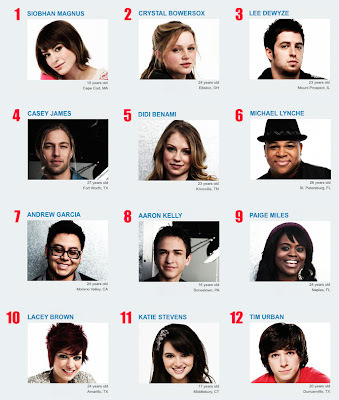 and #12 my prediction as first to be voted off. PENALTY POINTS FOR LATE ENTRANTS: If your prediction doesn't come in before the first round (when there were 12 contestants), you are penalized 1 point. If you miss the first two rounds, you are penalized 3 points. If you miss the first three rounds, you are penalized 6 points. No more entries after the first three rounds and we are down to 9 contestants. Michael Robertson still not talking to shareholders. It's been nearly two years since Michael Robertson sold Linspire to Xandros without any shareholder input. To this day, Robertson has never held a shareholder meeting or sent any communication to the one hundred or so Linspire shareholders with the details about that transaction. As you may know, in October 2008, I initiated a lawsuit as a shareholder of Linspire relating to actions taken by Michael Robertson and Larry Kettler in operating Linspire and their mismanagement of the company. I have settled this matter, receiving no money from Linspire personally, but required that a condition of settlement be that I be allowed to disclose to the other shareholders the information I learned during the litigation about what happened to the company’s assets. Specifically, under the terms of the settlement agreement, I have been authorized to disclose to the shareholders of Linspire how Linspire’s funds were used by category, how much cash Linspire had at the time its assets were sold to Xandros, and a specific accounting of distributions to Linspire’s shareholders or shareholder related entities. It is important to note that the settlement specifically states that this disclosure I am making is not made on behalf of Linspire, Michael Robertson or Larry Kettler. As of July 31, 2007, Linspire had $3,802,531.20 of cash on hand. As of June 30, 2008, when Linspire sold substantially all of its non-cash assets to Xandros, Inc., Linspire had $1,077,952.58. Between June 2007 and June 2008, Linspire expended: $286,329.96 on its data center. Between July 2007 and July 2008, Linspire expended: $1,629,907.06 in payroll expenses. Between June 2007 and June 2008, Linspire paid Ajax13, a company related to Michael Robertson, $180,000.00 for a licensing fee for certain software Linspire was allegedly using. Finally, Xandros acquired Linspire for 4,098,360 shares of Xandros (a privately held company). I was unable to verify the valuation of those shares or to obtain who or what entity currently owns these Xandros shares. I have tried to send this information to all the shareholders of whom I am aware and for which I have a method to contact them (via email addresses or social media services). To the extent you know any other Linspire shareholders, please feel free to forward this to them for their information. It would appear this is the best the Linspire shareholders can hope for. No shareholder meeting. No detailed explanation. In fact, you'll notice one of the terms of the settlement was that the disclosure was NOT made "on behalf of Robertson," who is clearly doing everything possible to avoid any accounting to Shareholders. What in the world did Linspire need from Ajax13 to warrant a $180K payment to this Robertson-owned company? As the former CEO for Linspire, I can't think of a single thing that Ajax13 had which Linspire needed, but I can certainly see Ajax13 needing Linspire's cash. It appears that Robertson forced Linspire into liquidation so he could take the $600K (and presumably all the Xandros stock), and yet has kept the company going to attack former employees. The 100 some-odd shareholders still hold stock in Digital Corner Stone, Inc., and that company has lawsuits going on, attacking former employees and trying to shut down Freespire.com. I still own shares of that business. I don't want to see them attacking good people. 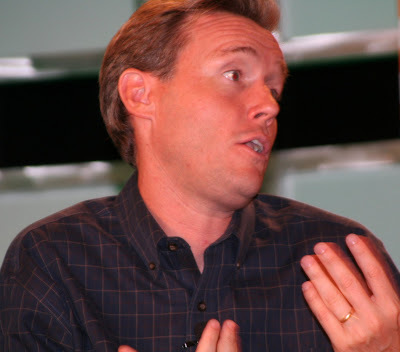 To this day, Robertson is using Digital Cornerstone to attack Theresa, Cliff, Randy, and others, forcing them to each spend thousands in legal bills defending their good names. I have no problem with Robertson as a preferred shareholder getting what is rightfully his due. What I DO have a problem with is 1) him doing everything he did without sharing any information to shareholders for years, and 2) him transferring the assets out of the company as some "liquidation," and then keeping the company going so that Robertson can attack good, honest people. Michael acts as if because he put up millions, he's the only one who deserves to be treated with any fairness or respect in the Linspire failure. He gives no credit to the 100 or so shareholders who wrote checks to buy shares in the company and exercise stock options, or the employees who worked countless, dedicated hours. When I left there, the team of employees left the company profitable with millions in the bank. How are they rewarded? With legal attacks. The $600K Robertson took was only made possible because of the work those employees did. You could take all the salaries from all the employees he is attacking, for the entire time they worked at Linspire, and it would not equal the revenue these employees brought in to Linspire in their last year there alone. Way to "take care of the peeps" Robertson. Not long ago, I emailed Michael and offered to take down Freespire.com and even purge all my blogs about him if he would back off his legal attacks against these good people. Robertson declined my offer and to this day continues his attacks. Even if what he did was technically proper, the way he has treated shareholders and employees is unethical and wrong. That's what I have a problem with.